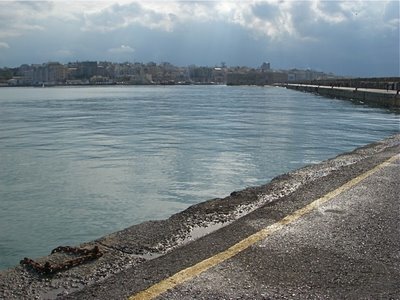 On Sunday after a rainy and cold morning the clouds subsided and the Sun shined down on Iraklion. The water at the hostel became hot, and I showered and shaved. The notion about life is….if you’re cold, and in need of a shower—the weather is wet and hampering the hot water (in many places the hot water tank is on the roof that heats with solar power) when the time arrives for a break in the weather, a hot shower, freshly shaved, warm feet….oh how pleasurable the experience consists of within the moment. It is what establishes the moment into a miracle. The view from the Harbor. Sunday was a lively day in Irakloin. Every February 22, there is a treasure hunt, the winner receives around 4000 Euro, lots of motorbikes driving the streets. The center area of Iraklion consists of coffee shops, restaurants and pubs, lots of people around the area, a decent midsize city. During the sunny break, I walked out onto the walkway marina, a walkway about a kilometer at length that spans the harbor. 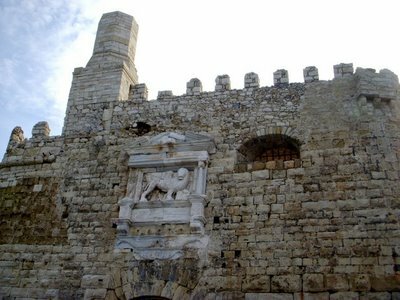 The walkways entrance is flanked by the fortress of Iraklion. 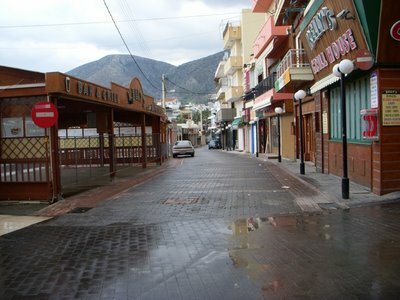 The dead streets of Hersonisos, the area will come alive after Easter when the tourist start arriving. Carnival is every weekend in February that is related to lent, although I haven’t looked up the details. Every weekend people dress up in Halloween customs and have a good time, it seems. I even saw some kids here in Anogia that were dressed in customs this evening. 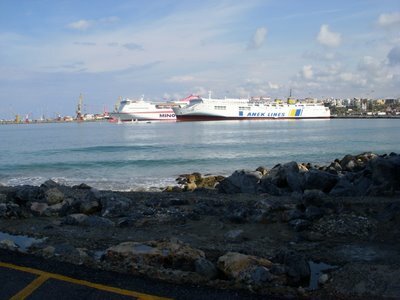 The first boat is the boat I traveled on from Athens. I am Anogia and will be heading out tomorrow. Visit my Twitter profile for the updates. Next post: The Greek Weather Report. 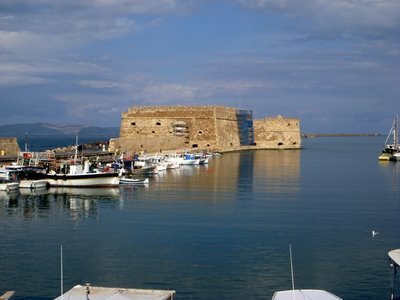 Previous post: The Boat Ride—Couch-Surfing—Crete.